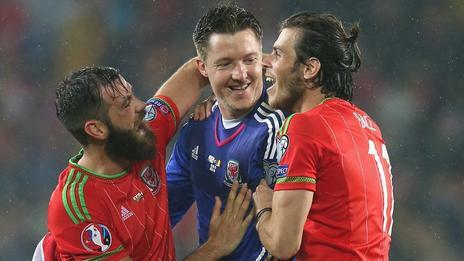 Fifty-Seven years have passed since the last time a Welsh National Team played in a major international tournament. In that time generations have passed, political landscapes have changed, countries have fallen with new ones taking their place, man has walked on the moon and you can now get hot dogs baked into your pizza crust. But the one constant has been Wales looking on forlornly as the World Cup and European Championships were played without them. But with the combined effect of an expansion of qualifying nations for Euro 2016 from 16 nations to 24, and the fact that Wales are taking their group by storm, the country better known for its rugby may be on the verge of making it into the finals next year in France. On Friday the Welsh won one of their biggest matches in recent memory as they took down much fancied Belgium 1-0 in Cardiff with a goal from Gareth Bale. This puts Wales at the top of Group B of Euro 2016 qualifying with 14 points after six matches played, while Belgium sits in second on 11 points. The top two sides in the group will automatically qualify for the European Championships, with the third place side going into the playoffs. With a 0-0 draw in the away fixture to go along with yesterday's result the four points Wales have taken from their two matches against Belgium, along with thrashing third place Israel 3-0 in Haifa, has Wales are so close to France they can almost taste the Croissants. Besides the three frontrunners, the group is rounded out by Cyprus, Bosnia and Andorra. With four matches remaining in the group, the Welsh side of Gareth Bale and Aaron Ramsey may be on the cusp of finally emulating the achievements of the great John Charles led side that made it to the Quarter-Finals of the World Cup in Sweden in 1958.